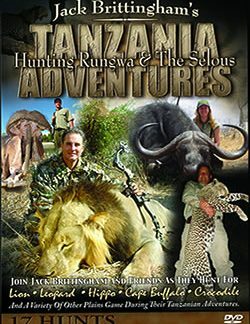 Journey to Tanzania in pursuit of dangerous game with Jack Brittingham along with friends and family as they hunt the famous Selous game preserve. Within its sprawling 17 million acres, vast herds of Cape Buffalo, Elephant, Hippo, plains game, and big cats roam the primal landscape as they have since the dawn of mankind. For those few who seek untamed adventure here on safari, this ancient land dares them to straddle that razor edge between excitement and mortal danger. 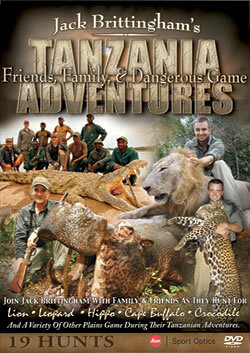 Those are the spicy ingredients that spawn high African adventure in an unspoiled place where life or death can still be measured in the tremble of your crosshairs. Dark adventure runs deep in the vast landscape here and can at times come charging into your lap when you least expect it. 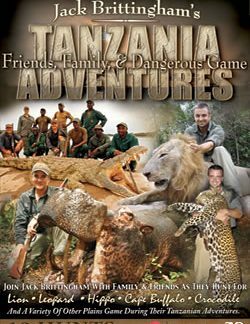 Venture into the unknown of each day with anticipation that almost anything can happen on the trail of adventure in wild Tanzania.